Rich in history, blessed with stunning scenery, and offering wonderful opportunities for outdoor sports and recreation, Bentonville is a city on the move. Part of the vibrant Northwest Arkansas region that ranks among the fastest-growing in the US, this charming city of almost 30,000 draws deeply from its pioneer roots and Ozark heritage. 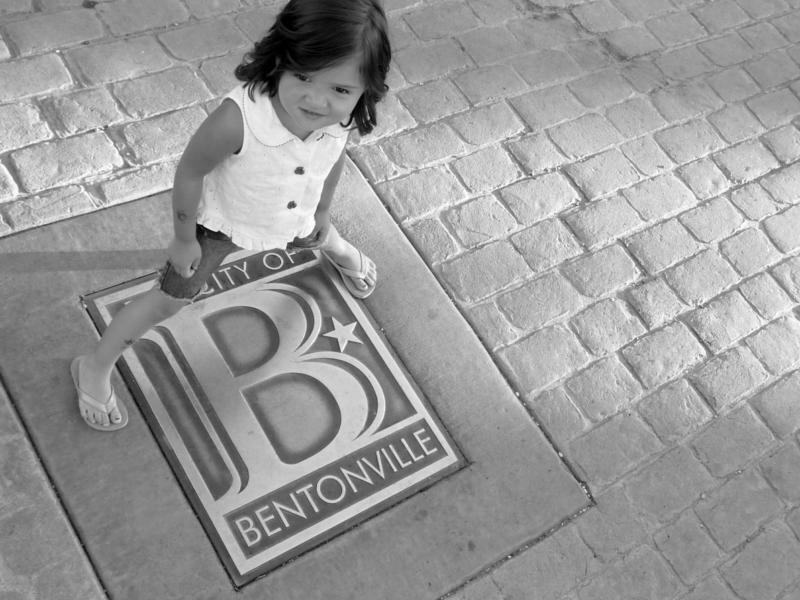 Family-friendly neighborhoods and its intimate historic Downtown reflect the city’s small-town and rural community values, yet Bentonville welcomes newcomers and supports business, and is full of excitement about the future. Bentonville is Benton County in the Ozark Mountains, in Northwest Arkansas. It is located at an elevation of 1300 feet in the gently rolling wooded hills and deep valleys of the Ozark Mountains. Bentonville is 20 miles from Fayetteville, 77 miles from Springfield, MO, and 96 miles from Tulsa, OK. In 1836 Benton County was established as the first county in the state of Arkansas, with Bentonville as County Seat. Through the intervening decades, many of them tumultuous, Bentonville has maintained its historic character and still boasts 72 historic buildings and homes within its city limits, including the well-known Peel House Mansion and Historical Gardens. The Peel Mansion was built with meticulous care in 1875, using the best local materials and craftsmen. With his wife Mary, Colonel Samuel West Peel, a pioneer businessman, Indian agent and Confederate soldier who became the first native-born Congressman from Arkansas, raised their nine children on the farm and apple orchard surrounding the house. A splendid example of an Italianate mansion, it has been beautifully restored and furnished with extraordinary period furniture and embellishments to create an authentic early Victorian ambience. In addition to its historic and scenic charms, Bentonville has become famous as the home of the founders of Wal-Mart and the site of their first retail outlet. The original Wal-Mart still stands in Bentonville’s town square, serving as a visitors’ center to illustrate and remember Wal-Mart’s history, its rural roots, and the philosophy of its founders, who exemplified the small-town virtues of frugality, hard work, and dedication. The front of the premises recall an old-time “five and dime” store, while the rooms in back form a kind of museum housing relics and mementoes marking the stupendous success of the Walton family and their company. Scheduled to open in 2009, the Crystal Bridges Museum of American Art in Bentonville will be one of the foremost art museums in the United States. Set in gorgeous Arkansas woodland, the stunningly designed Museum is the brainchild of Alice Walton of Wal-Mart fame. When completed most of the 25,000 square feet of gallery space will house masterworks of American art from the colonial period to the present day. The Museum will also feature a 250-seat indoor auditorium, areas for outdoor concerts and public events, sculpture gardens and walking trails, and exhibits of Native American art as well as the work of regional artists and special collections from national art institutions. Wal-Mart Stores, Inc., the world’s largest service and retail corporation, has its headquarters in Bentonville, and many large and small companies (including some listed in Fortune 500) have regional offices in Benton County to support their accounts at Wal-Mart. The huge Tyson Foods Corporation- the world’s largest meat processor- is located in nearby Springdale. The economy of Northwest Arkansas is booming, with rapid population growth and many new businesses being established, including high-tech and knowledge-based industries. Unemployment is so low as to be practically non-existent. Bentonville is a rapidly-growing town in an area experiencing high population growth and economic expansion. Its real estate market currently favors buyers, with a very wide range of homes available in all price ranges. There is growing interest in upscale residential developments and gated communities in the area, including some fabulous lakeside and golfing communities. Boasting nine public parks, an aquatic center, 19 baseball and softball fields, six soccer fields and a recreation center which houses two basketball courts and a weight room, Bentonville provides plenty of opportunities for exercise and sports. The nearby town of Bella Vista has seven golf courses, 12 lighted tennis courts, eight lakes, swimming pools, and several playgrounds. Surrounded as it is by the spectacular beauty of the legendary Ozark Mountains, Bentonville has so much to offer lovers of the outdoors, with wonderful State parks and natural playgrounds like Beaver Lake, Devils Den State Park, Lake Wedington, and the vast Ozark National Forest only minutes’ drive away. At 12,000 acres, the lovely Hobbs State Park & Conservation Area is the largest state park in Arkansas. Noted for its fascinating wildlife, glorious wildflowers, and intimate associations with the region’s pioneering history, Hobbs offers miles of trails for hiking, horseback riding, and mountain-biking, great hunting, a free shooting range, and much, much more. For garden and nature lovers, a visit to the newly opened Botanical Garden of the Ozarks is a must. The Garden’s 86 acres adjoin Lake Fayetteville and include nine separate gardens on themes that highlight the beauty and environmental variety of the Ozarks. There is also an amphitheater, boat rental facility, exhibit gallery, observatory cafe, education center, conservatory, special children’s area, and trails for walking and biking. Bentonville’s golfers are especially well-provided for, with more than 20 stunning golf courses very nearby. The Bella Vista residential community alone boasts seven championship-quality golf courses featuring 117 holes of golf, and there are five more public and private golf courses in Benton County, with many more in adjacent Washington County. For many Bentonville’s greatest attraction is the wonderful scenery of the historic Ozarks region, and there is no better way to enjoy this than to drive the fabulous Boston Mountains Scenic Loop on U.S. 71 and I-540. Snaking through the rugged mountain ridges and deep valleys, US 71 follows the contours of the land and gives you a taste of what travel in the region was like in days gone by. By contrast, I-540 is a modern super-highway that soars across the countryside, a triumph of man over nature. But whether they are traveled in the Fall with its glorious colors, or during the lush green growth of Spring, or at any time of the year, both legs of the Scenic Loop offer expansive views and intimate glimpses of the rivers, stream, and hardwood forests of this beautiful region. The Bentonville area is home to some of the State’s most popular art and craft fairs, including those at War Eagle, Spanker Creek, and in the historic Bentonville Town Square. The two fairs held each year since 1954 at War Eagle Farm & Mill are renowned for the range and quality of their exhibits and for the absolutely stunning scenery and historical richness of their location. Just minutes from Bentonville, the fair at Spanker Creek Farm is another outdoor event held in the lovely rural Ozarks, while a second indoor fair is held twice a year at the Clarion Hotel and Convention Center in Bentonville. Whether you want to buy beautiful local and regional art works or produce home-grown and home-made in the traditional way, or just to soak up the atmosphere and relaxed Ozarks lifestyle, the Ozarks fairs are a wonderful outing for all the family. You don’t have to love motor bikes to enjoy the fabulous Bikes, Blues, & BBQ Festival, held each Fall just down the road in Fayetteville. Attracting as many as 350,000 avid onlookers, this four-day event features dozens of bike events, some of the hottest national and regional blues, rock, country, and jazz bands playing free on two stages, “babe” contests, mouth-watering food of every kind, and much more. Offering something for everyone, the Festival prides itself on its contributions to regional charities, the 2006 event raising over $150,000 for worthy causes.